UPDATED, 3:01PM Saturday: Selma director Ava DuVernay took time out today to Tweet her responses to Friday's post about the conspicuously non-diverse casting of Gods Of Egypt, and Lionsgate and Alex Proyas' uncharacteristically quick public acknowledgement of the matter. 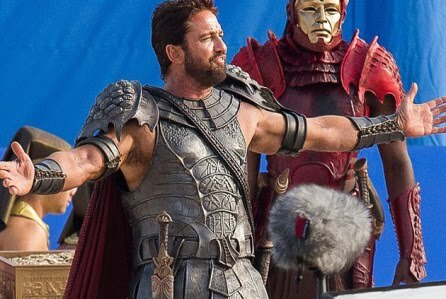 PREVIOUSLY, 12:18PM Friday: Both Lionsgate and the director of its upcoming Gods Of Egypt have apologized for the film's much-disparaged casting, with Lionsgate releasing a statement, first reported by Forbes today, conceding that the company "failed to live up to our own standards of sensitivity and diversity." Alex Proyas' film about mortals and gods of ancient Egypt, stars Brenton Thwaites, Nikolaj Coster-Waldau, Gerard Butler, Rufus Sewell and Geoffrey Rush and opens February 26. Last week, following the release of a trailer, Deadline's Ross A. Lincoln wrote that "based on the statuary and monuments that have survived, not to mention thousands of years of other cultures commenting on them, [ancient Egyptians] definitely weren't white people with flowing, curly blond locks, and their gods were definitely not Europeans. To me, casting here stands out like a sore thumb leftover from 1950s Hollywood." In the joint statements, Lionsgate responded to widespread criticism: "We recognize that it is our responsibility to help ensure that casting decisions reflect the diversity and culture of the time periods portrayed. In this instance we failed to live up to our own standards of sensitivity and diversity, for which we sincerely apologize. Lionsgate is deeply committed to making films that reflect the diversity of our audiences. We have, can and will continue to do better.​​"
Proyas' statement reads: "The process of casting a movie has many complicated variables, but it is clear that our casting choices should have been more diverse. I sincerely apologize to those who are offended by the decisions we made." Lincoln and other journalists have noted that that the film's trailer recalls the similar controversy that met Ridley Scott's Exodus: Gods And Kings last year. In the new film, Thwaites plays a mortal on a mission to save the world, enlisting the god Horus (Coster-Waldau) in an alliance against god of darkness Set (Butler). Chances are high that the tomb of Ancient Egypt's boy-king Tutankhamun has passages to a hidden chamber, which may be the last resting place of Queen Nefertiti, and new evidence from the site will go to Japan for analysis, experts said on Saturday. British Egyptologist Nicholas Reeves announced plans for further investigations at a news conference with Egyptian Antiquities Minister Mamdouh el-Damati, who said data would be taken to Japan for study and that chances were high that a chamber exists. "We said earlier there was a 60 percent chance there is something behind the walls. But now after the initial reading of the scans, we are saying now its 90 percent likely there is something behind the walls," said Damati. "We have the data but we must analyze it to understand. But we are working in the Valley of the Kings, so we are expecting to find antiquities behind the wall." Did Stone Age people collect honey from beehives similar to this one, made from a hollow log? If you eat honey or use a beeswax product this weekend, you will be following a very ancient tradition. An international study of pottery fragments from archaeological sites across Europe, the Middle East and north Africa shows traces of beeswax going back 9,000 years. The researchers, based at Bristol University, examined chemicals trapped in the clay of 6,400 potsherds from 150 sites. They found the unmistakable molecular fingerprint of beeswax in many places across the Neolithic world, indicating a widespread association between honeybees and humans in prehistoric times. The results appear in the journal Nature. The oldest chemically unambiguous trace of beeswax is in a cooking pot dating back to 7000BC from Catalhöyük in Anatolia. Intriguingly, an early wall painting at the same site shows a honeycomb-like pattern. Mélanie Roffet-Salque, lead author, says: "The most obvious reason for exploiting the honeybee would be for honey, as this would have been a rare sweetener for prehistoric people. However, beeswax could have been used in its own right for various technological, ritual, cosmetic and medicinal purposes, for example to waterproof porous ceramic vessels." Beekeeping is known to have been important in pharaonic Egypt, where wall paintings depicted hives, bees and honey — the oldest surviving example dating to about 2400BC. The Bristol team wanted to find out how widespread the use of honey and beeswax was and how far back it went. "The lack of a fossil record of the honeybee means it's ecologically invisible for most of the past 10,000 years," says Richard Evershed, head of Bristol's organic geochemistry unit. "Although evidence from ancient Egyptian murals and prehistoric rock art suggests mankind's association with the honeybee dates back over thousands of years, when and where this association emerged has been unknown — until now. Our study . . . shows widespread exploitation of the honeybee by early farmers and pushes back the chronology of human-honeybee association to substantially earlier dates." The research showed a northern limit for the exploitation of bees in Europe: about 57 degrees latitude. Examination of hundreds of vessels from Scotland, Norway, Sweden and Finland showed no trace of beeswax, suggesting that the climate there was too cold for bees. Because the technique depends on analysis of clay vessels, it cannot go further back than the origins of pottery. Nor can it indicate when people started to make hives for bees rather than relying on finding wild honey. Roffet-Salque suspects that Stone Age people might have used simple hollowed-out logs, like the modern French one shown above. CAIRO: The sarcophagus of Ankh-f-n-khonsu, a high priest of ancient Egyptian god Amun Ra, has been unearthed in the west bank of Luxor, Antiquities Minister Mamdouh al Damaty announced Thursday. "The sarcophagus is made of wood and covered with a layer of plaster. It represents the deceased wearing a wig and crown with flowers and colorful ribbons along with ceremonial beard and a necklace adorning his chest," Sultan Eid, Director of Upper Egypt Antiquities Department said in a statement Thursday. Apparently, the tomb has been reused more than 500 years after it was completed, Mahmoud Afifi, the head of the Ancient Egyptian Antiquities Sector at the Antiquities Ministry said, adding that the sarcophagus is "well preserved." 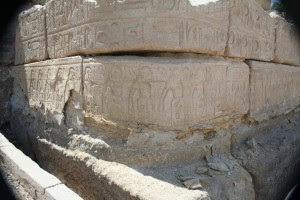 Discovered in 1978, the tomb of Amenhotep-Huy is located at Qurnet Marei, part of the Theban Necropolis on Luxor's west bank, said Karar, adding that multi-national team of archaeologists led by the Institute for the Study of Ancient Egypt in Madrid has been studying and renovating the architectural elements of the tomb since 2009. Most of the scenes at Amenhotep-Huy's tomb represent the vizier's daily life activities of agriculture, hunting and fishing. 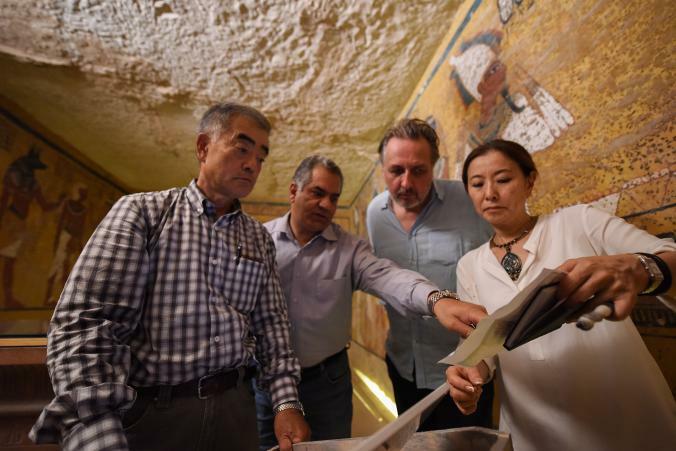 It also features scenes of female musicians and dancers and shows Huy, among his family members, being greeted by high priests, archaeologist Sherif el-Sabban told The Cairo Post Saturday. 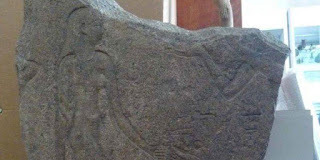 Granite wall fragment that Egypt is trying to restore from Switzerland. Antiquities Ministry Facebook page. CAIRO: Egypt is working on repatriating a set of eight ancient artifacts that were smuggled to Switzerland following the 2011 uprising, Antiquities Minister Mamdouh al Damaty announced Saturday. 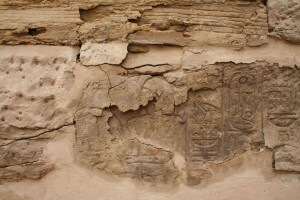 The artifacts in question span several eras of the ancient Egyptian history and were illegally excavated from several archaeological sites across Egypt, said Damaty. "These artifacts were monitored during a routine search of international auction halls periodically carried out by members of the ministry," Head of the Restored Antiquities Department Ali Ahmad said in a statement Saturday. 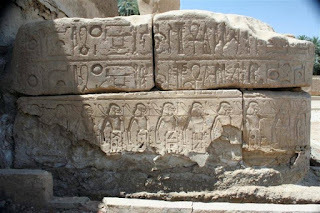 One of items, dating back to Egypt's Greco-Roman era, is among other artifacts looted from the Temple of Behbit Al-Hegara, said Ahmed. "The artifact is registered in the Egyptian antiquities' records, which will facilitate the ministry's mission to repatriate it," he added. During the past few years, Egypt has taken legal actions to restore dozens of artifacts smuggled amid the rising illicit digging activities carried out in several Egyptian archaeological sites following the 2011 uprising. 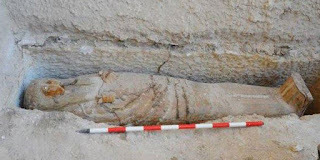 The other artifacts include a Late-Period funerary limestone fragment, a Pre Dynastic pot, an old Kingdom stone block, a female wooden statue that dates back to the 6th Dynasty, a Greek statue, and finally two coffins also from the Greek Era, said Ahmed. It is estimated that around $3 billion in Egyptian antiquities have been looted since the outbreak of the January 25 Revolution in 2011 and the consequent security lapse across Egypt, according to the International Coalition to Protect Egyptian Antiquities, a U.S.-based initiative partnered with Egypt's Antiquities Ministry. During the past four years, Egypt has recovered over 1,600 artifacts and is currently working on other cases in many European countries, former Ministry of Antiquities Museums Sector head Ahmed Sharaf previously told The Cairo Post. "It is impossible to provide an accurate number of the artifacts that have been stolen since the January 25 Revolution," he said. CAIRO: Several heritage activists have voiced their concern over footage recently circulated on social media showing erosion of stone surface of an ancient Egyptian temple. 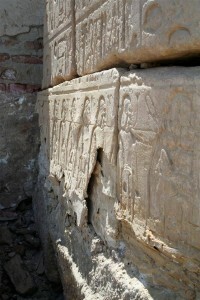 The photos show the layers of plaster falling off the walls and columns of two temples; allegedly Madinet Habu and Seti I temples in Egypt's Luxor. "I am not sure whether the photos are old or new. However, they indicate failure and carelessness of the stakeholders," Ahmed Shehab, assistant of the head of the Archaeologists Human Rights Care Association posted on his Facebook page Wednesday. He called on the antiquities ministry to issue a statement explaining more details about the issue and immediately embark on restoring the erosion showed at the photos describing the incident as "farce." Profile shot shows the layers of plaster, which contaings carvings and hieroglyphic inscriptions, partially detached from the stone surface. Facebook. 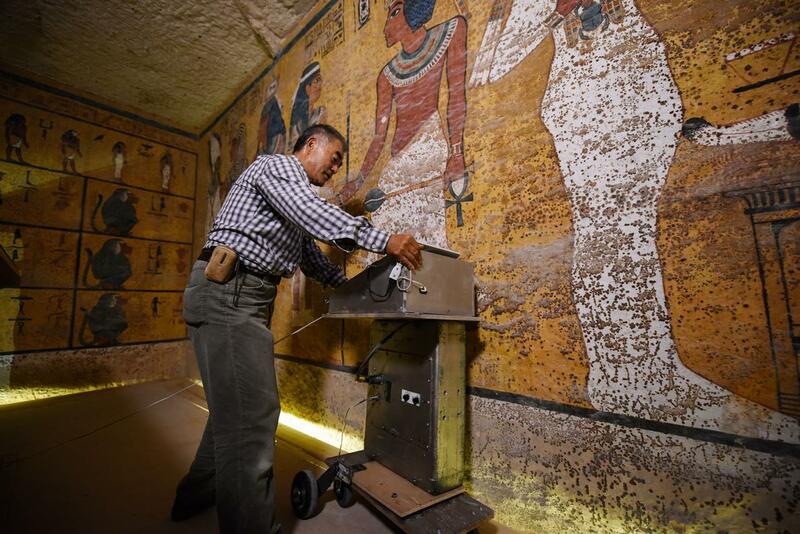 Hirokatsu Watanabe, a radar specialist from Japan, pushes his specially modified Koden-brand machine along the north wall of Tutankhamun's burial chamber. LUXOR, Egypt—After two days of radar scans in the tomb of Tutankhamun, archaeologists have concluded that preliminary examination of the data provides evidence that unopened sections lie behind two hidden doorways in the pharaoh's underground burial chamber. The results, announced Saturday morning at a news conference in Luxor, bolster the theory of Nicholas Reeves, a British archaeologist who believes that the tomb contains another royal burial. The hidden tomb, he has speculated, belongs to Nefertiti, King Tut's mother-in-law, who may have ruled as a female pharaoh during Egypt's 18th Dynasty. If so, this would be only the second intact royal burial site to be discovered in modern times—and it would, in the words of Mamdouh Eldamaty, the Egyptian antiquities minister, represent "one of the most important finds of the century." At the press conference, he said he was "90 percent positive" that another chamber lies behind the north wall of the tomb. On Friday, Eldamaty stood next to that wall, which is painted with a scene depicting the burial rituals of the boy pharaoh, who ruled in the 14th century B.C. "The radar scan tells us that on this side of the north wall, we have two different materials," he said. "We believe that there could be another chamber." Together these features lend credence to Reeves's theory, which he made public in July. Since then examinations of the physical features of the burial chamber have added support. But until the tests began on Thursday, the evidence ran no deeper than the surface of the walls. Radar scans had never previously been conducted in the tomb, and they represent a crucial step in the investigation. For the first time, specialists have collected data about both the material structure of the walls and the open spaces behind them. It's these spaces that are most intriguing—they could contain artifacts and possibly even burial goods that rival those found with Tutankhamun. 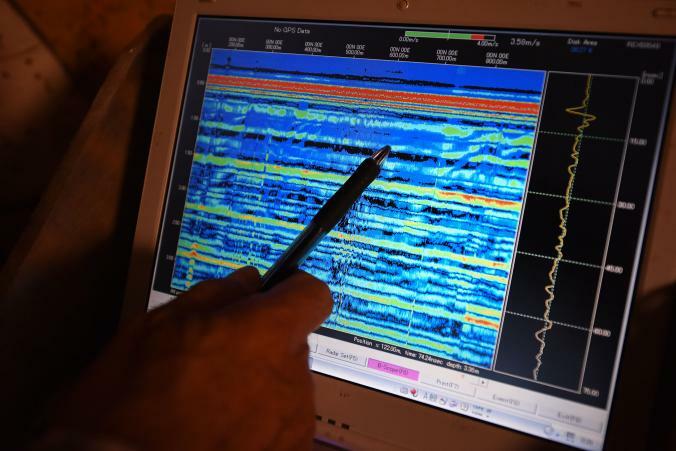 "Everything is adding up," Reeves, a National Geographic grantee, told me on Thursday evening, immediately after a suspenseful examination with the radar. We were standing next to the north wall, whose painted scene has been visible since 1922, when Howard Carter rediscovered the tomb. But after observing the scans, I found that the wall looked different to me—I couldn't help but imagine what may lie beyond. "The tomb is not giving up its secrets easily," Reeves continued. "But it is giving them up, bit by bit. It's another result. And nothing is contradicting the basic direction of the theory." In Tut's tomb, Watanabe needed to scan sideways, through the walls. To do this, he had adapted a Japanese-made Koden-brand radar machine. The body and antenna normally sit on a small, wheeled trolley, pointing straight down; Watanabe commissioned a Japanese company to remove the radar, turn it sideways, and reattach it to the trolley. He's 73 and remarkably fit, but he had travelled 20 hours to reach Luxor, and the pressure of the job clearly weighed on him at the beginning. The work started at midday with a test scan in a nearby tomb called KV5, where Watanabe used the machine to examine walls with known features behind them. Within half an hour, he was drenched in sweat—the deeper reaches of tombs in Luxor are hot and airless. But the results showed the machine was working well, as did a second test run along another wall that is already known to have a room behind it, this time in the tomb of Tutankhamun. 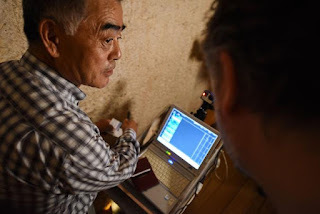 By 7 o'clock, Watanabe seemed re-energized, and he was ready to scan the west wall of the burial chamber, which Reeves believes contains a blocked-in doorway. There were around two dozen people in the tomb: Eldamaty, Reeves, Abbas Mohamed, an Egyptian professor of applied and environmental geophysics, a couple of journalists from the Egyptian state press, and film crews from National Geographic and Tokyo Broadcasting System Television. (The investigation—supported, in part, by the National Geographic Society—is being documented for a National Geographic Channel special to premiere globally in 2016.) Everyone stood well back from Watanabe, who was alone in a corner of the west wall. A week earlier, I had spoken on the phone to Jason Herrmann, a specialist in archaeological geophysics at the Eberhard Karls Universität Tübingen in Germany, and he told me that some results should be evident immediately. He also said that radar would reveal much more than any other type of scan, and it was likely to track any blocked-over partition or doorway. "It should be very clear," he told me. After going halfway, he aborted. He fiddled with the machine for a moment, and then he called out in Japanese, "Can I have a piece of string?" Someone scurried off to get a rope. 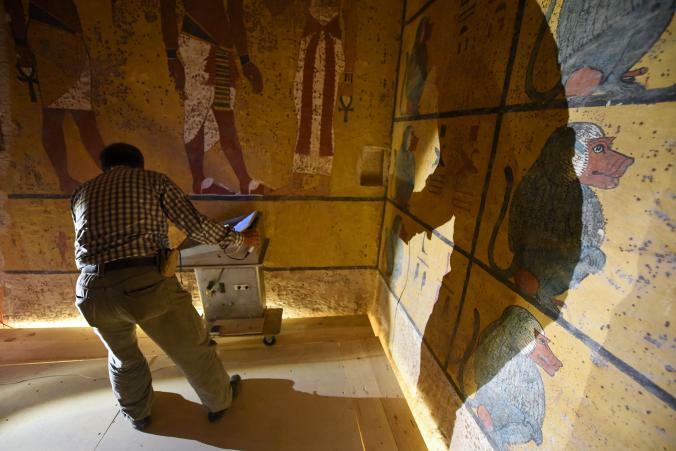 From the beginning, the current investigation of the tomb of Tutankhamun has been driven by high technology. "I've been coming to this tomb for thirty years," Reeves had said earlier on Thursday. "But the most interesting discovery in this tomb occurred not in the tomb, but on the Internet." Watanabe, gesturing to the tomb's wall, confers with Reeves about the radar scans. In 2009, a Madrid-based team of conservators and artists called Factum Arte began conducting high-resolution laser scans of the tomb. Their primary goal was to create an exact replica—one of Factum Arte's core conservation principles is that high-tech facsimiles allow people to experience famous archaeological finds without damaging the originals by their presence. But Factum Arte is also determined to support open scholarship, and they posted all of their scans online. The material quickly caught the attention of Reeves, who at the time was working at the Metropolitan Museum of Art. "The nice thing about the scans is that for the first time ever we were able to see the actual physicality of the walls of the tomb," Reeves said. "If you look at the painted scenes, the decoration obscures that. But take away the paint, and you see a completely different landscape." The Factum Arte scans portrayed the texture of the walls in black and white, without the distraction of the scenes. On the north and west walls of the burial chamber, Reeves noticed a series of perfectly straight vertical lines that seemed to correspond to the shape of partition walls and doorways. "The more one looked, the more one saw," he said. Slowly, he began to consider other types of evidence: He analyzed the layout of the tomb, the various known features, and the scenes on the walls. He's a specialist in the 18th Dynasty, one of the most dynamic and mysterious periods in the history of ancient Egypt. Akhenaten, an important pharaoh of this era, tried to radically change key elements of the belief system to focus on the worship of a single deity, the sun god Aten. His principal wife was Nefertiti, who became co-regent. "For some years now, it's been known that Nefertiti enjoyed supreme powers, powers greater than those of a normal queen," Reeves said. "For example, on certain relief blocks from Luxor and Karnak temples she's shown smiting Egypt's enemies, a position which is usually reserved for the king alone." For years Reeves has believed that Nefertiti outlived her husband and became pharaoh, at which point her name changed to Smenkhkare. There's a precedent for such a phenomenon. Earlier in the 18th Dynasty, a royal widow named Hatshepsut became pharaoh and one of the most powerful figures of the period. As part of Reeves's research, he examined the goods from Tut's tomb. Despite their fame, they have not been well studied in the past. Reeves concluded that about 80 percent of the artifacts had originally been made for somebody else—a woman. He found definitive evidence that even the famous golden funerary mask had been modified—the artifact has traces of a previous cartouche. When Reeves combined this research with what he noticed on the Factum Arte scans, he believed that it all told the same story: Nefertiti had become pharaoh after Akhenaten and had been buried in a tomb that was then hastily adapted for Tutankhamun, who died suddenly when he was 19 years old. In July, Reeves published a paper—"The Burial of Nefertiti? "—that laid out his ideas. The tomb is not giving up its secrets easily. But it is giving them up, bit by bit. It's another result. And nothing is contradicting the basic direction of the theory. "When I first published my paper I think that colleagues around the world thought I was crazy," he said. "But I think it has changed. I think people believe that even if the tomb of Nefertiti isn't behind the wall, they believe that something else is there." In late September, Eldamaty, Reeves, and others conducted a careful examination of the tomb and found features that support the theory. Among other things, they noticed a chiseled line in the ceiling, and Eldamaty discovered a clear contrast in the surface texture of the north wall; both of these features correspond exactly to the markings of the Factum Arte scans. At that point, it became more than just a theory—there was physical evidence.Earlier this month, an Egyptian and French team conducted thermographic, or infrared, scans, and while the results seemed to indicate some structural irregularities in the walls that match Reeves's theory, they were inconclusive, possibly because the room was too hot. "The numbers are still down," Bedr said, when I asked him about tourism, which is the key pillar of Luxor's economy. "In October [Luxor hotels were at] 15 percent of capacity. This month, it's been 20 percent. In 2009 and 2010, it was 100 percent." With all the hope for some positive attention, the pressure has been evident on everybody who is involved in the Tutankhamun investigation. On Thursday night, right before Watanabe began to scan the west wall of the burial chamber, Eldamaty was asked how he felt. "A little bit nervous," he said. Then he corrected himself: "I would say quite nervous." After the aborted scan, Watanabe tinkered with the radar machine and decided that he didn't need the string after all. The room hushed, and he began to push the cart along the wall once more. After moving a little more than half of the distance, he broke the silence: "They changed the material here." This was exactly the point at which there seemed to be a doorway on the Factum Arte scans. Watanabe is not an Egyptologist, and he had not studied Reeves's ideas closely, but what he observed on the radar matched up. He did one more scan of the west wall, and then he proceeded to the north. "It's just a solid wall," he called out, at the beginning. He reached the section of the wall that Reeves had proposed was a blocked-over partition. "There is a change from here," Watanabe announced. After he was finished, he studied the multicolored bars that ran across the computer screen. "Obviously it's an entrance to something," he said through a translator. "It's very obvious that this is something. It's very deep." He scanned the wall again and confirmed the initial reading. Reeves asked him if he wanted to do another round. "I don't need to," Watanabe said. "It's good data." Standing next to the north wall, Reeves and Eldamaty looked relieved, although both said they wanted to wait for Watanabe to analyze his data. "I feel strangely detached from the process because I've lived with it for so long," Reeves said. "If I'm right, this is so far beyond what anybody could hope for. It's difficult to accept." The next day, Eldamaty and Reeves confirmed that the initial analysis of the data was extremely encouraging. It showed at least two materials: bedrock and something else. "The transition from solid bedrock to non-solid bedrock, to artificial material, it seems, was immediate," Reeves said, speaking of the north wall. "The transition was not gradual. There was a strict, straight, vertical line, which corresponds perfectly with the line in the ceiling. It seems to suggest that the antechamber continues through the burial chamber as a corridor." He continued: "The radar people tell me that we can also recognize that behind this partition there is a void." Eldamaty has said that Watanabe will spend another month analyzing the data, and then he will give final, detailed results. When I spoke with Ray Johnson, the director of the Chicago House, an epigraphic research center of the University of Chicago that is based in Luxor, he told me that most people in the field are intrigued by Reeves's work, with some reservations about his conjecture that Nefertiti might be entombed there. "The idea that perhaps this is a burial of somebody specific—that's a little harder sell," Johnson said. "There just isn't a lot of evidence one way or another. That's something that a lot of our colleagues have a problem with, being very specific about what may be behind any partition walls." He continued, "But at the same time we accept the fact that if there are additional chambers found, there's a possibility that they are storage chambers. And the possibility of another burial is really intriguing and exciting. But who can be there? We're missing the entire royal family, except for Tutankhamun. It could be anyone. But the possibilities are wonderfully exciting." In recent years, Johnson's research has also provided compelling evidence that Nefertiti was a pharaoh. He hopes that thermographic scans, which Eldamaty plans to carry out again, might show that the queen's cartouches originally had been painted on the north wall, which would identify the tomb as intended for her. "An earlier tracing should be detectable," Johnson said. Eldamaty told me that if the evidence continues to build, in the future they probably will penetrate one of the hidden chambers by drilling a small hole in the wall of the side room that is known as the Treasury. It adjoins the possible corridor behind the north wall, and most important, it has no painted scenes that could be damaged. "We can put a hole in it and put inside a small camera to look to the other side," Eldamaty said. If a camera reveals artifacts within, the ministry would likely have to investigate a way to safely remove the north wall and its paintings in order to access the chamber. The north wall depicts the "opening the mouth" ceremony, a traditional practice in which the new ruler uses an adze, a ceremonial tool, to open the mouth of the previous king's mummy, a ritual that now seems strange and exotic. But I wondered what Tutankhamun would have made of today's scene: a cluster of cameras and serious faces, all of them silently focused on a Japanese septuagenarian pushing a small cart along an underground wall. Barry Kemp, an archaeologist who has excavated for more than 30 years at Amarna, the royal city of Akhenaten and Nefertiti, once told me that he didn't like to use the word "religion" with regard to ancient Egypt because of its modern connotations. He wonders if it should be considered more like science, or pseudo science, because it was such a fundamental underpinning of the world for ancient Egyptians, who may have accepted core concepts of faith as absolute truth. And he notes that today we do a modern version of the same thing—after all, few of us really understand the scientific truths that we take for granted. In the tomb of Tutankhamun, the intense attention and respect that all of us showed during the scanning was itself a kind of faith. It was quite possibly the strangest ritual that had ever been carried out in this tomb. Afterwards, while I was standing next to Tutankhamun's mummy, Reeves wandered over, looking exhausted but happy. "I feel like him, actually," he said, gesturing at the figure under glass. "He's a bit of a specter at the feast, isn't he?" W1307: snakes and green-skinned goddesses. Brooklyn Museum: Isis dressed in Roman clothing.